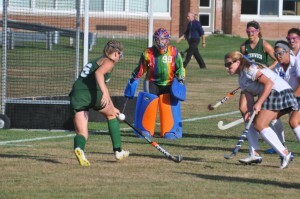 Granville’s field hockey team posted a 3-0 victory over Salem last week in a Wasaren League match. Jennifer Roberts scored twice and Bridget Decker made seven saves to lead the Horde. Bri Kelly also scored for Granville. Monday, the Horde played well again, but came up short, losing 3-2 to Schuylerville. Katelynn Leavey and Nicole LaPlante both scored and Jen Roberts assisted for Leavey, Lauryn Zovistoski assisting for Nicole. Decker made two saves. The Black Horses got the game-winner with 6:40 left in the match. Unbeaten Hoosick Falls got three goals and three assists from Grace Delurey in a 10-0 victory over the Horde. Amy Baker made 16 saves for the Granville. Granville is 0-3 in league play and 0-5 overall. Phil Hicks made 29 saves as Tamarac posted a 5-0 victory over the Horde Monday afternoon. Zack Horton scored twice for Tamarac. Granville is 0-4 overall and 0-4 in Wasaren League play. Granville dropped a 3-0 decision to Hoosic Valley in a Wasaren League match. Hoosic Valley won 25-13, 25-15, 25-18. Emily Campbell had two kills and one block for Granville. Brandon Thomas was Granville’s top runner, placing seventh in 17:69 as the Horde competed in a home, non-scoring meet last week. Matt Decker was 14th in 18:48, followed directly by Russ Ahfeld, 19:06, and Ryan Dalaba, 19:13. Andy Williams was 19th in 19:29. Granville stood at 1-9 after a 5-0 loss to Hoosic Valley last week. The Indians’ Frank Acker was the medalist with a 40 at the Battenkill Country Club.